Got a cough or cold? The students at McBride High School’s Health and Medical Pathway have some sage advice on how to help prevent such maladies. Wash your hands properly and regularly. The students won a top national award for a handwashing campaign. McBride earned the top honor in the 2016 Healthy Schools, Healthy People, It’s a SNAP Awards. The awards are sponsored by the School Network for Absenteeism Prevention program, a joint initiative of the Centers for Disease Control and the American Cleaning Institute. The program seeks to improve hand hygiene habits to prevent the spread of infectious disease and reduce related absenteeism. McBride called their bilingual handwashing campaign “Los Guerreros del Jabón,” or “Soapy Warriors.” They wrote a bilingual song on the basic steps and timing to teach the right way to wash one’s hands. Students prepared classroom presentations and bilingual posters for each classroom at nearby Patrick Henry K-5 Dual Immersion School, with calendars for each student to take home, including stickers to track when they washed their hands. McBride students first researched websites and invited a health educator from the Children's Clinic to learn how to deliver the proper handwashing guidelines. The students’ presentations included a demonstration using Glo Germ Gel and black lights, which show splotches of germs on hands (and a dramatic reduction in germs after handwashing). In all, McBride students taught 19 classes from transitional kindergarten through second grade. “Our students are genuinely involved in making a difference in the community,” said McBride’s Nationally Board Certified Spanish teacher, Laura Castillo. Her students linked their Spanish unit of study on “The Power of the Word” with the school’s Health and Medical Pathway. “The students learned that the power of the word, through action and positive leadership, can greatly and beneficially influence the community and promote healthy habits,” Castillo said. EW! 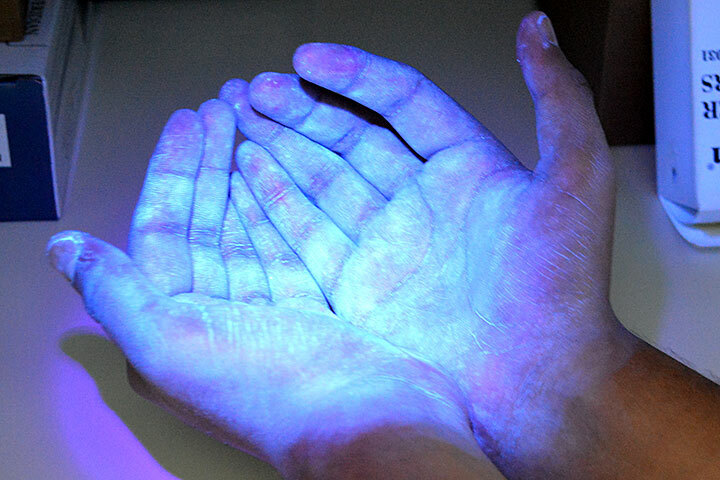 – Students at McBride High School used Glo Germ Gel and black lights to show how germs can spread. The demonstration was part of an educational campaign about handwashing.